As a parent, you know the enormous potential your child has within, but sometimes you might worry they won’t make the most of their natural gifts. Maybe your child can’t focus long enough to get things done. Maybe he doesn’t have enough self-control. Or maybe she’s shy and plagued by self-doubt. That’s where karate for kids in Bakersfield really makes a difference. 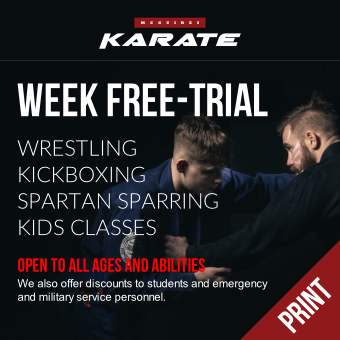 At McGuires Karate in Bakersfield, we’re passionate about what we do because every day, we see exactly how life-transforming the study of martial arts can be. 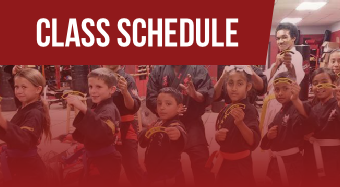 Our kids karate classes and programs for children age 4 and up are unique in that we combine both a world-class martial arts curriculum and a world-class character development curriculum. That’s why we’ve developed an outstanding character development curriculum for our karate class students. In order to move through our belt rank system, students have to meet requirements for both the physical and the character portions of our curriculum. That’s what sets our karate apart from other karate schools in Bakersfield. THE RIGHT PROGRAM FOR YOUR FAMILY? If you’re deeply committed to helping your child reach his or her peak potential in all aspects of life, then McGuires Karate in Bakersfield will be a great fit. Karate helps kids focus better, because learning new kicks, blocks, and forms takes concentration. Children also learn how critical it is to pay attention to their opponent’s movements. Martial arts build up children’s confidence so that they are able to project an aura of strength and ensure that bullies do not perceive them as easy targets. Karate lessons for kids provide a clear-cut and consistent structure of discipline that helps them learn which types of behaviors are acceptable and which are not. At Urban Martial Arts, we teach children in Brooklyn that everyone deserves respect and that no one deserves to be mistreated. Also, if they want to be respected by others, they first must learn to respect themselves. Karate helps kids become more aware of their own thoughts and emotions, training them to control negative impulses that will stop a negative situation from spiraling into conflict or violence. As students rise through belt ranks, students also come to understand the importance of helping newer students and being a model that others want to emulate. Self-defense techniques are a core part of our martial arts curriculum. When children know how to defend themselves, they will naturally project a much more confident image and thus not come across as an easy target for bullies.